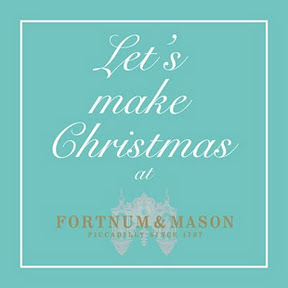 I've been making presents for Christmas for a while now and love @vanessakimbell's push to #letsmakechristmas. As I mentioned on twitter I've been collecting windfall apples (apparently an old type of Golden Delicious) from my parents garden. This is on top of some I was given by a friend (Bramleys) and some wild ones (no idea what variety). There is something I find very satisfying about making something from ingredients I have picked or foraged. The only slight issue was what to do with them all. After peeling and blanching what seemed like 3000 apples to put in the freezer I wanted to try something else! I keep reading and hearing about Apple Butter. It seems to be an American recipe which is a bit like a thick fruit compote. I love cooked apples so it sounded right up my street! Basically you roughly chop 4lbs of apples and put them in a large pan including all of the skin, cores, pips etc (this is for two reasons. 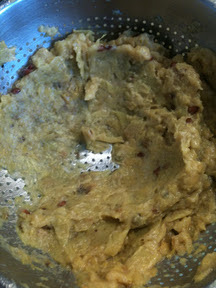 Partly as there is a lot of flavour in these parts and also as there is a lot of pectin which helps the butter to set. Plus it was a massive relieve given I was a little bored of peeling and coring apples). 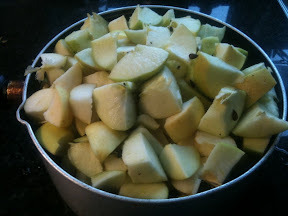 This is an awful lot of apples and although the pan was large they barely fit, luckily they cook down pretty quickly. I used a mixture of golden delicious and bramleys to get the sweetness and sharpness of the different varieties. I then added about a cup of water or apple juice and a good splash of cider vinegar and cooked until the apples were very soft. This will take about 30mins depending on the type of apple. Once the apple is cooked it's time to sieve it to get a smooth purée. Use the back of a spoon to gradually push the apples through the sieve until you are only left with skin, core, pips and so on. Now for every for every cup of purée you have add 1/4 cup of caster sugar and add the zest and juice of one lemon. At this stage you can also add spices such as cinnamon or nutmeg but I decided to make plain. Bring the mixture to a boil and then turn down to a simmer for an hour or two, stirring every so often until the mixture is very thick and slightly browner. 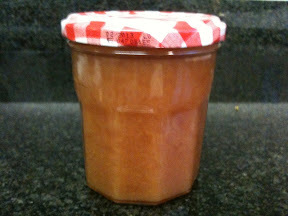 Place the mixture in sterilised jars. I made 4 jars. I tried a little of the apple butter in 0% Total Greek yoghurt and it was delicious. It is also supposed to be great on toast or as a filling for pancakes. I picked to rowans for this ages ago and put them in the freezer. Apparently if you pick them before the first frost it's good to freeze them to allow them to break up more. This also meant they didn't go off whilst I was too busy to make them into anything. You start by taking the rowan berries off their stalks and then add an equal weight of apple cores and skins. Add water to about half way up the fruit, bring to the boil and then reduce to a simmer until it is soft and broken down. 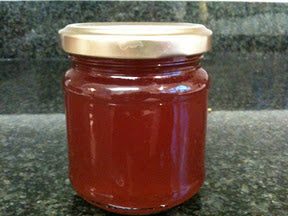 Pour the mixture into a jelly bag or piece of muslin over a bowl and drain for a good few hours or over night. Don't push the fruit through otherwise the jelly will be cloudy. For every litre of juice at add 750g caster sugar plus a couple of cloves and a few strips of lemon zest. Stir the mixture to dissolve the sugar and then slowly increase the heat to a rapid boil for 10 mins or 106C if you have a sugar thermometer. 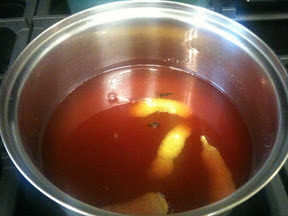 Remove the zest and cloves and pour into sterilises jars to set. This still has quite a dry flavour but goes well with meats and cheeses. It was such a fun event last Friday, only there were so many people there I no longer know who I met and who I didn't. 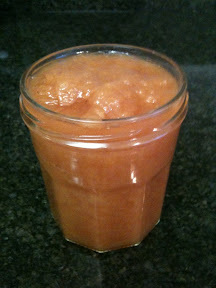 I made apple butter last year. 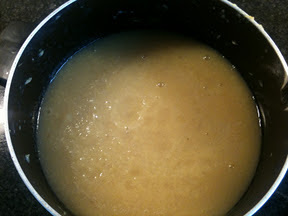 I was really pleased with the result, but swore I'd never do it again as I spent 3 hours stirring it almost continuously. I didn't use much in the way of sugar, but it was still surprisingly sweet. I know it's very difficult to talk to everyone isn't it! I found the same thing. I used about half of the sugar that the recipe asked for and still found it quite sweet. I think I could get away with less sugar next time. I didn't stir it all of the time as had the gas very low, but took a long time!